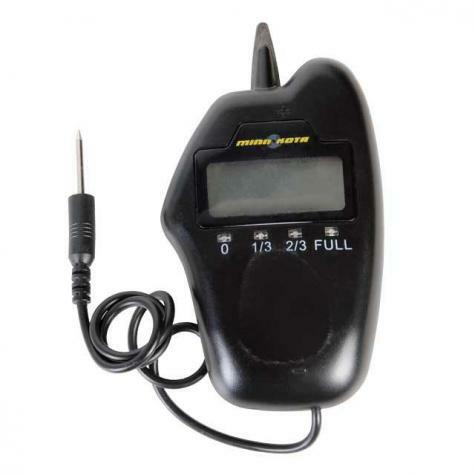 Measures battery voltage when "+" and "-" probes are touched to battery's corresponding "+" and "-" terminals. 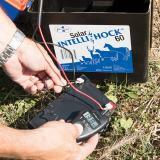 Voltage of a fully charged 12V battery is no lower than 12.6V. A 40% charge will read 12.2V. Voltage of a fully charged 12V battery is no lower than 12.6 volts. A 40% charge will read 12.2V. Absolutely recharge the battery if the reading falls below 12.2V. Do not draw a 12V battery below a 40% charge (12.2V). Drawing below this point will reduce the battery's ability to hold a charge and/or be recharged back to full (over 12.6V). Batteries MUST remain fully charged in freezing conditions. Sealed Lead Acid Deep Cycle Battery, 12 volt, 7 amp. hr. These rechargeable batteries are durable and safe for all 12v energizers. Sealed Lead Acid Deep Cycle Battery, 12 volt, 12 amp. hr. Sealed Lead Acid Deep Cycle Battery, 12 volt, 18 amp. hr. Sealed Lead Acid Deep Cycle Battery, 12 volt, 26 amp. hr. Sealed Lead Acid Deep Cycle Battery, 12 volt, 33 amp. hr. 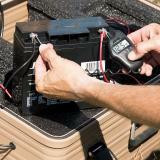 Sealed Lead Acid Deep Cycle Battery, 12 volt, 44 amp. hr. Sealed Lead Acid Deep Cycle Battery, 12 volt, 66 amp. hr.